The Traverse City St. Francis Gladiators beat the Charlevoix Rayders at home on Thursday night 56-47. 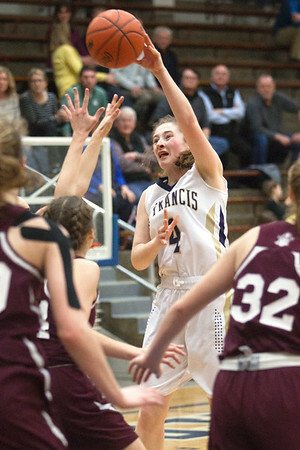 St. Francis' Sarah Chouinard (4) tosses the ball to a teammate during the fourth quarter of the game against Charlevoix at Traverse City St. Francis on Thursday night. The Gladiators beat the Rayders 56-47.